As an employer you probably already protect and promote the physical well-being of employees with health and safety training, access to fitness classes/gyms etc. Protecting their mental well-being is not so easy – you may not even be aware that this is needed. This is often only noticed when someone becomes ill. 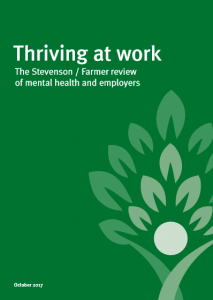 Many employers are already creating healthy, inclusive workplaces, but more needs to be done so that employers provide the support needed for employees with mental health conditions. 300,000 people with a long term mental health problem lose their jobs each year – a much higher rate than those with physical health conditions. Since 2009 the number of sick days lost to stress, depression and anxiety has increased by 24% and the number lost to serious mental illness has doubled. The leading cause of sickness absence in the UK is mental ill health, accounting for 70 million sick days – more than half of the total every year. A number of randomised controlled trials of workplace mindfulness-based training courses have found positive effects on burnout, wellbeing and stress. Studies have shown that those practicing mindfulness report lower levels of stress during multi-tasking tests and are able to concentrate longer without their attention being diverted. Other research suggests that employees of leaders who practise mindfulness have less emotional exhaustion, better work life balance and better job performance ratings. 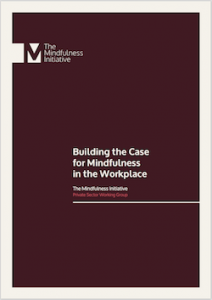 The research supporting these benefits can be found in Building the business case for mindfulness in the workplace report – click on the report.